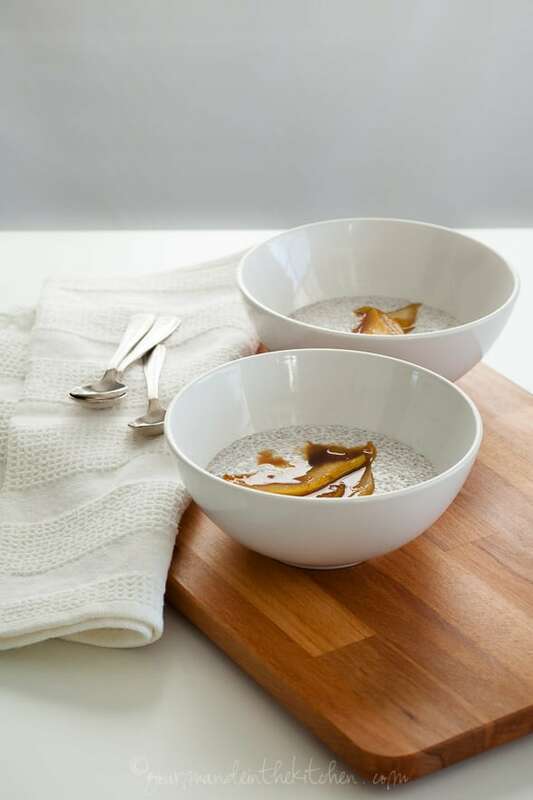 Take a little time in the morning to sit down to a nice warming bowl of vanilla bean chia porridge with caramelized pears. I just can’t seem to get enough of chia seeds for breakfast. 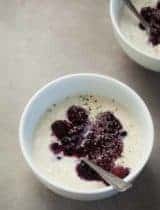 I love the creamy yet chewy texture of chia puddings and porridges not to mention how quick and simple they are to prepare. Simply throw the seeds in the milk of your choice and let them swell overnight in the fridge for an almost instant breakfast the next morning. During the warmer months I like mine cold straight from the fridge with a swirl of fruit puree, but when the weather gets cool I make a warm chia porridge to keep me full and fueled for the morning. If you like a warm bowl of oatmeal for breakfast but want a grain-free option, I think this chia seed porridge will be right up your alley. 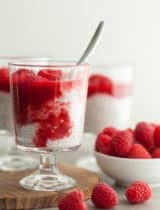 And if you’re a fan of tapioca pudding then this will be like eating dessert for breakfast! A fragrant vanilla bean is split and scrapped right into a mixture of coconut milk and chia seeds and left to infuse overnight. (If coconut milk is not your thing, simply swap it out for the milk of your choice.) The next morning the mix gently heats on the stove while you prepare the caramel pear topping. 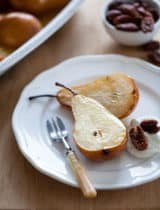 Thinly sliced pears are sautéed with butter (or coconut oil) and coconut nectar to create a quick caramel sauce that’s finished with a pinch of salt to bring out it’s complexity. 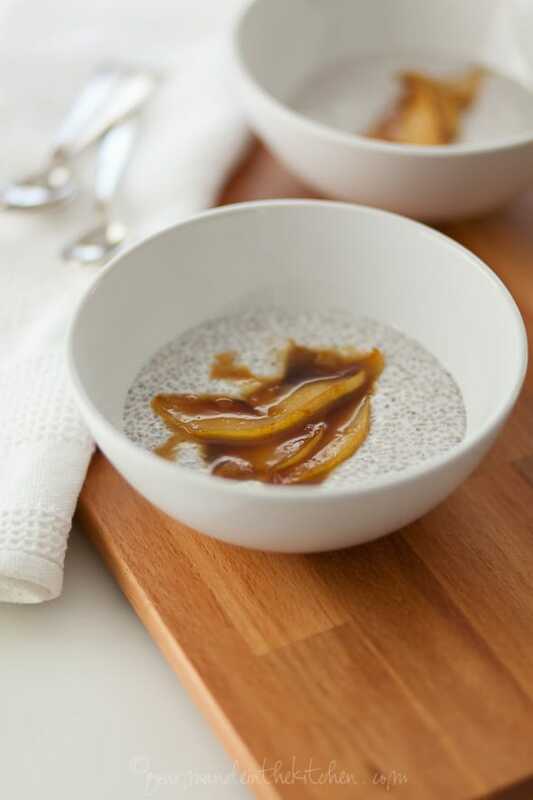 Tender and nearly transparent, the softened pears are piled onto the warmed chia porridge and topped with a generous a drizzle of the coconut caramel. Sometimes I’ll add a sprinkle of cinnamon for extra warmth and spice, but it’s completely optional as the caramel pears stand on their own. 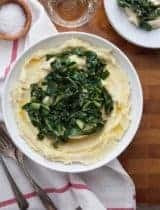 Creamy with enough chewy texture to keep it satisfyingly hearty this is the kind of breakfast that feels like a special treat. 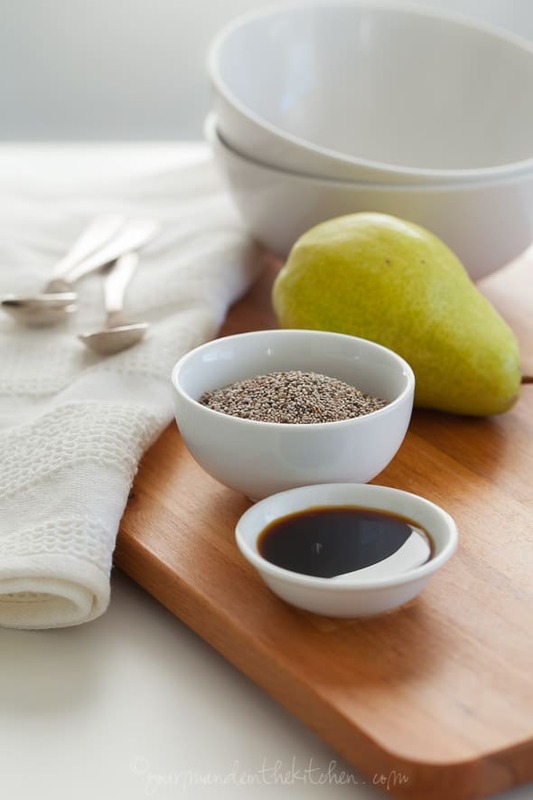 A warm chia porridge topped with sauteed pears to keep you full and fueled for the morning. Start the night before. Stir together the coconut milk, salt, chia seeds and vanilla bean seeds in a jar or sealed container. Refrigerate overnight to plump. Stir to incorporate the seeds if they have settled the following morning. The next morning make the sautéed pears. In a medium skillet, over medium heat, melt the butter or coconut oil. In the meantime gently reheat the chia porridge in a small saucepan or in the microwave until warm but not boiling. Remove the pears from heat and add a pinch of salt. 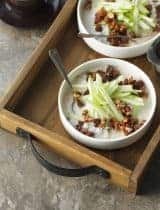 Spoon the warmed porridge into cups and top with the pears and caramel syrup; sprinkle with ground cinnamon if desired and serve immediately. Such an awesome way to begin the day! Love this! I'm a huge fan of chia seed pudding or porridge as well. This caramel pear topping is the answer to my prayers! 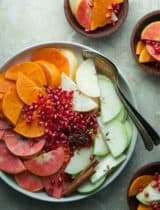 In the summer, I served it up with lots of summer stone fruit, but wasn't sure what to put on it as we head into fall. And these photos are gorgeous! 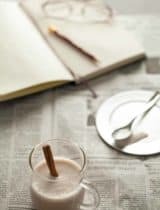 I hadn't thought to do a warm chia porridge but it sounds like a great alternative to my usual chia pudding, especially heading into the colder months. Pears are my fruit of choice right now too! Gorgeous breakfast! Love the caramel pears! I am always up for anything to so with chia seeds! This porridge is right up my alley! This porridge is just beautiful and such a perfect healthy start to the day! I'm all about the pears these days. 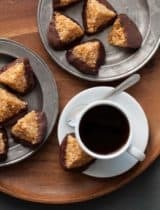 These look mouth-watering! such gorgeous photos. and i love the idea of making this breakfast autumn style, most people think of chia porridge only in the summer. I do love the occasional grain free option. This looks every bit as yummy as oatmeal. You ingredients sound amazing and you have convinced me. Your photos are beautiful too! I have never tried chia seeds in a pudding or anything like this. I will have to try it now that it is cold in the mornings. Sounds wonderful with the pears. I've never tried chia seeds in anything before, but I adore vanilla and that bowl looks awfully delicious so I think I'm going to have to give them a go soon. I'm a chia seed virgin. So wrong. I need to try this. Immediately. This sounds sooo delicious! As well as healthy and beautiful with all the jewel like chia seeds. This is so beautiful! I have yet to try chia porridge but I need to change that right away! Sautéed pears are such a wonderful idea over the chia porridge. I've never used coconut nectar, very curious to give it a try. Beautiful photos. The mornings have been so crisp and cool lately. What a wonderful way to start the day! the sauteed caramel pears truly take this porridge to a whole new level. i just love it and I could eat those pears all by themselves! I find chia puddings are such a great base for so many toppings/add-ins/flavours. I've never heated chia pudding to make a porridge! I need to give this a try. OMG this is quite possibly one of the most BEAUTIFUL breakfast I have EVER seen!!!! Pinning immediately! Love you for this! This looks amazing!! Ahhh I am definitely going to try this. Your photos are stunning! What lens do you use if you don't mind me asking?